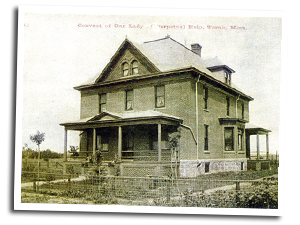 This historic brick house was built in 1907 as the convent for the St. Benedictine nuns – and remained so until the early 1980s. The open front porch with white wicker chairs, a wrought iron bistro set, and pots of red geraniums greet our guests. The glass paned front door opens to rooms with 10 ft. ceilings, original hot water radiators, beautiful stained glass windows, and original woodwork. Pocket doors still grace the spacious interior along with an open staircase leading to the second floor of bedrooms. After the convent was closed, it was soon reopened as an assisted living facility called Mother Lucille's Leisure Living. The owner, Kathy Schultz, operated it for 25 years, retired in 2011 and put the house up for sale. The house stood empty for six months until Kathy reopen it as a quilting/scrapbooking retreat center, with Holly Roush as manager. Over the next 4 months, paint colors were picked, rooms decorated, all new furnishings and beddings were delivered. Now four and half years later...the next chapter of Simply Sisters begins. Holly Roush became owner of Simply Sisters Retreat Center in December 2016. "It gives me great honor to continue the legacy which began with Kathy, welcoming guests as simply sisters - paying tribute to the sisters who once graced the hallways of this stately home. I've enjoyed meeting so many wonderful guests – all the creative artisans with their quilts and scrapbooks to the many families and even musicians." Simply Sisters can be a perfect location for your bridal shower, groom's supper, or even a small intimate wedding - either inside this grand house, on the open front porch under patio lights or there's plenty of lawn for a picnic or ceremony. With 12 bedrooms, your bridal party can stay the night and get ready for the most memorable day - your wedding day! Please contact Simply Sisters and we can help you create that special day! "This is the most well-equipped quilting retreat facility I've ever been to." I think it's just wonderful that this home with such wonderful history, will now go on to be a lively place for many who will share their talents, works, and each other when they meet for their events. The nuns were a part of this community for years teaching many generations all they needed to know as they grew up and renewing their faith. Then it housed the elderly and people who needed assistance. Having worked there for fifteen years I know each room was filled with many people who left behind their history and loving stories.